With its fierce face, prickling with unusual curved horns, a new dinosaur found in southern Utah has been named after a fearsome eponym: Cronus, the Greek god who castrated his father with a scythe. But names aside, the newly discovered species of ceratops is offering scientists rare new insights into a group of dinosaurs whose remains are rarely found in the Southwest. Paleontologists believe it’s an early form of centrosaurine, a type of ceratopsid typified by a short skull, a big nose, and a small but often lavish frill around the back of its head. The fossil consists of most of the animal’s skull, originally discovered in 2006 in a layer of mudstone in Utah’s Grand Staircase Escalante National Monument, not far from the Arizona border. And the skull fragments mostly fit the description of a centrosaurine, said Eric Lund, a researcher at Ohio University’s paleontology lab. But the specimen took the dinosaurs’ frill ornaments to new lengths. 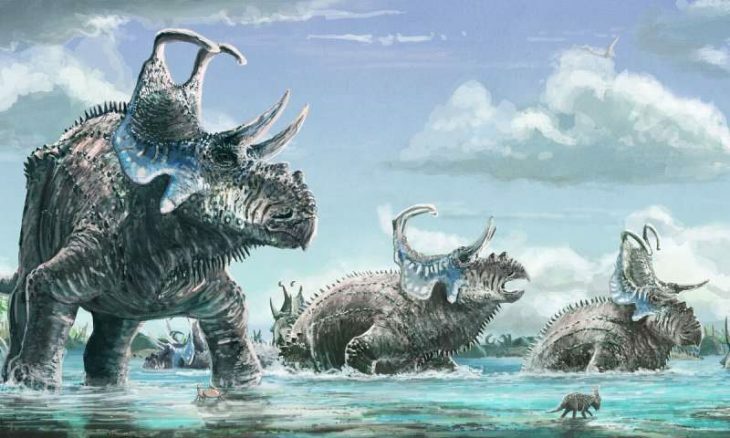 In part because of its large, curved, fluted horns, it was deemed both a new genus and species, named Machairoceratops cronusi — “machairo” after the Greek word for “bent sword,” and “cronus” for the deity who neutered his more powerful father, Uranus. “Machairoceratops is unique in possessing two large, forward-curving spikes off of the back of the neck shield, each of which is marked by a peculiar sulcus, or channel, extending from the base of the spike to the tip, the function of which is currently unknown,” Lund said in a press statement. 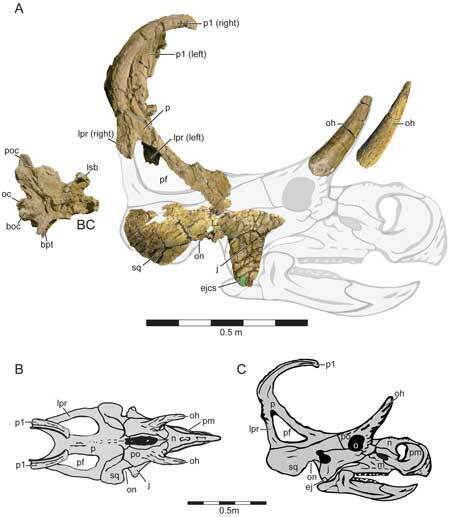 The horns — in addition to reminding people of Cronus’ weapon of choice — appear to be unique on such a ceratopsid, Lund and his colleagues report. But Machairoceratops also has many features in common with one of its contemporaries — the flamboyant Diabloceratops, another centrosaurine whose sole specimen has been found in Grand Staircase Escalante. At once similar but clearly distinct, the specimen was deemed “the definitive sister taxon” to Diabloceratops. 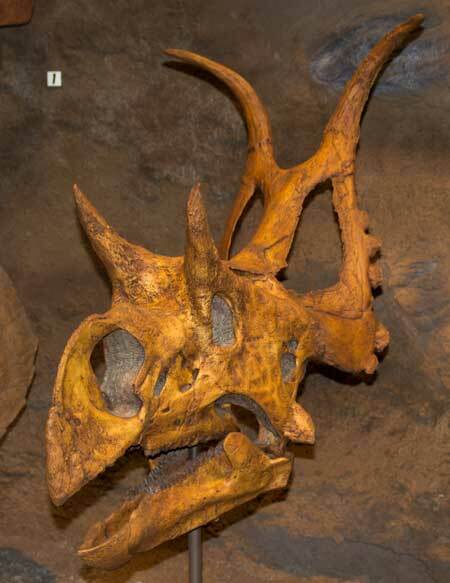 And, given that it was found in sediments dated to 77 million to 80 million years ago, Machairoceratops and Diabloceratops may be among the oldest ceratopsids yet found. Lund and his colleagues point out that the two types of dinos both lived in the southern reaches of what was once a mini-continent, known as Laramidia, that comprised much of the intermountain West. In the end, the discovery of Machairoceratops may add more to the natural history record than just a fearsome face and creepy name.